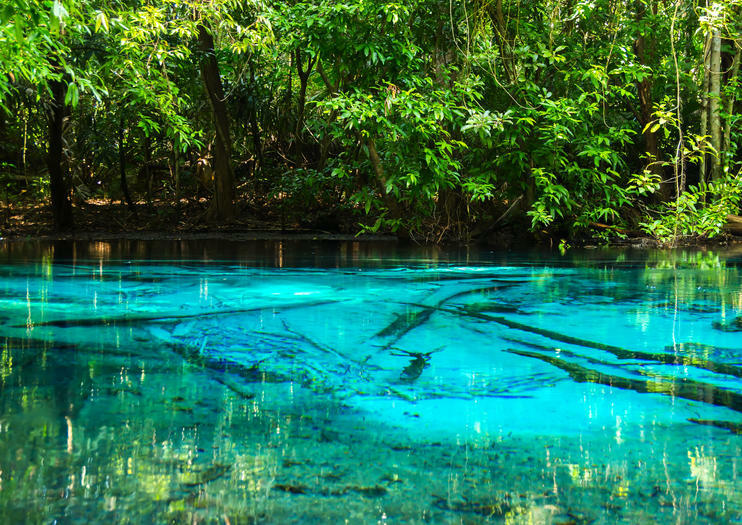 Originating from a warm stream in the lowland forest of Khao Nor Juji, the Emerald Pool (or Sa Morakot) is a hot spring located within the Khao Pra­Bang Khram Wildlife Sanctuary in Krabi. The dazzling Emerald Pool is 115 long, 214 meters wide, and deep enough to swim in (although, due to the high levels of calcium carbonate, visitors should avoid swallowing any water while doing so). The color of the water varies according to the reflection of the sunlight at different times of the day. To experience the most intense emerald hue, visit at dawn or as early in the morning as possible. There are three nature trails that lead to the Emerald Pool. The first is a direct 800­ meter path from the main entrance. The second is via ‘Thung Tieo­Sa Morakot’, which is around 1400 meters long and and more challenging, but is ideal for birdwatchers and nature lovers. The third method is the longest at just under three kilometers, and is a scenic nature trail through the forest. To reach the Emerald Pool from Krabi, take Highway No.4 to Khlong Thom and turn left on the road towards Thung Yai. Follow signposts to the Khao Pra­Bang Khram Wildlife Park from here. It is also possible to take a motorcycle taxi from Klong Thom. Discover Krabi's signature attractions nestled deep in the lush tropical landscapes and breathtaking rainforest. One of them is the Tiger Cave Temple aptly named for the rock formation nearby resembling a tiger's claw. The temple is a meditation center and its tranquility is guarded by the spectacular mountain range. Besides, there is Emerald Pool which located inside the National Park. There, you will get to soak yourself in a pond sporting a mysterious green hue thanks to the abundance of minerals from the surroundings limestone hills. Not only that, bask in the park’s calm atmosphere as soothe your tired body with natural healing and relaxation brought by the hot springs. Replenish your energy from the day’s adventure with delectable Thai food for lunch. Discover Krabi’s rainforest even better as the package includes round trip transfers services. Combine a visits to the Emerald Pool and hot springs with a kayaking journey through Krabi's Thalane Bay on this single tour from Krabi. Arranging these three activities independently may be time-consuming, but this tour includes all and all the details are taken care of. Listen to guided commentary on the area's flora, fauna, culture, and history as you explore. Take a jungle stroll, swim in a thermal hot spring and witness rubber-tree tapping on a full-day 4WD tour of Krabi’s rain forest. This excursion includes some incredible scenery, including the crystal waters of Emerald Pool and traditional palm oil plantations. Spend a day exploring some of the most important attractions in the Krabi area with this full-day excursion. You'll visit the Tiger Cave Temple to take in spectacular views, swim in the gorgeous Emerald Pool (Sa Morakot) and get the chance to checkout Namtok Ron, a beautiful hot springs waterfall. Learn about the ancient trading route, or ‘silk road,’ that once ran through Krabi on this day tour that includes a visit to the Khlong Thom Temple Museum, where you can see old coins, pottery, ceramic shards and beads made of stone and glass. Then continue to Tiger Cave Temple, a Buddhist meditation spot, before arriving at Emerald Pool for a refreshing dip. Finally, have lunch and a soak in the mineral waters of Wareerak Hot Spring Spa. See some of the area's best water features—the Emerald Pool and Waeerak Hot Spring—on this day tour with a guide. Make the most out of your visits to each stop by listening to guided commentary on the area's history, culture, and ecosystem. Other attractions include the Khlongtom Bead Museum and the Tiger Cave Temple. This full-day tour brings you to the 3 mainland attractions of Krabi. Check out the natural Namtok Ron (Hot Spring Waterfall) - Khlong Thom and trek to the natural bath of the Crystal Emerald Pool (Sa Morakot) with a refreshing swim in the pond. Climb the 1,237 steps to the top of Tiger Cave Temple (Wat Tham Suea) and enjoy impressing views of the Andaman Sea coastline. Discover Krabi's signature attractions nestled deep in the lush tropical landscapes and breathtaking rainforest. One of them is Wat Tahm Suea or the Tiger Cave Temple aptly named for the rock formation nearby resembling a tiger's claw. The temple is a meditation centre and its tranquility is guarded by the spectacular Ao Luk Thanu mountain range. Besides, there is Sra Morakot or the Emerald Pool which popular exotic spot for a refreshing swim. This freshwater pool located inside the Khao Phra Bang Khram Nature Reserve. There, you will get to soak yourself in a 120-square-meter pond sporting a mysterious green hue thanks to the abundance of minerals from the surroundings limestone hills. Not only that, bask in the park’s relaxing atmosphere as you bathe in natural hot springs in this notable national park. Explore the best locales to swim in clean blue waters up the shore of Koh Samui and find the opportunity to ocean kayak and swim in the wonderful surroundings of Marine Park.